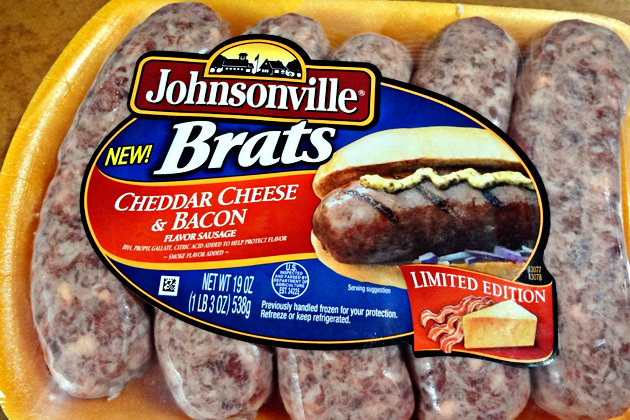 The great folks at Johnsonville recently sent me some of their limited-edition Cheddar Cheese & Bacon brats (available at WalMart), so I came up with this recipe just in time for the big game. These are a great way to serve brats to a crowd in a way that's fun, festive and finger-food-friendly. Most folks know that boiling brats in beer with onions and then grilling them is the traditional preparation. 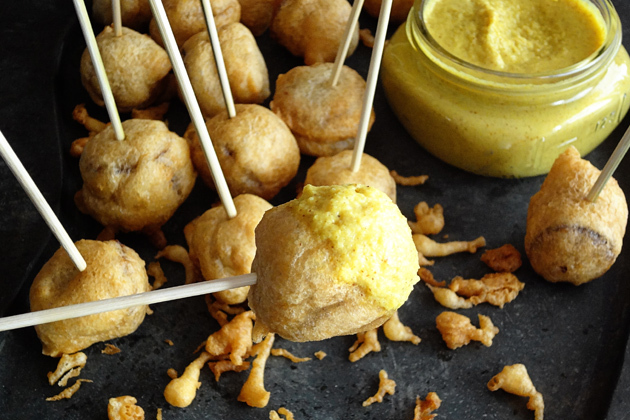 Well, I reversed the process by grilling the sausages just until they are barely done, slice them into two-bite portions, then I dunk them in a hearty beer batter and let them take a deep-fry swim until they are golden brown and slighly crispy. 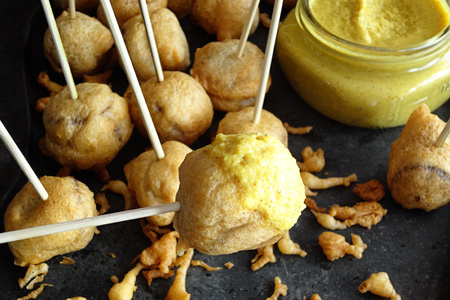 I serve these lolipop-style on skewers with a spicy sauerkraut mustard. Enjoy these and tip your cardiologist (he'll be jealous). Start your grill and prepare for indirect cooking over medium heat (325-350º). Grill the brats indirect for about 15-20 minutes, or until the internal temperature reaches 145º. Remove the sausages from the grill to a platter and let cool. Heat the frying oil in a large heavy pot (I recommend cast iron) to 360º. In a medium mixing bowl beat the egg white to light peaks. Add the flour, ale, baking powder and seasoned salt. Whisk to combine and set aside. When the oil is ready, slice each of the warm sausages into five equally sized pieces and toss them with the corn starch in a medium bowl. Working in batches of five, use a skewer to remove each piece of sausage from the corn starch, knocking off the excess. Coat each piece completely in the beer batter and carefully drop them into the oil, waiting a few seconds in between. Fry the brats until they are golden brown. Remove to a wire rack inside a lipped sheet pan that's lined with several layers of paper towels. Combine both mustards, the sauerkraut and applesauce in a small bowl. Blend well with an immersion blender until smooth. Serve the sausage on small skewers with the mustard for dipping. Great idea, perfect for parties. You say that "Most folks know that boiling brats in beer with onions and then grilling them is the traditional preparation" but that's just wrong. Brats should be cooked sous vide by simmering to 165 max internal temperature and finished on the grill, not boiled to 212 degrees. This is really important with the cheese type brats, I'm currently addicted to the Johnsonville Jalapeno & Cheddar brats. The same goes for cooking hot dogs. ericn1300 - Simmering/boiling brats in beer and onions then grilling is the traditional preparation. Yours may be different, but I was referring to tradition. I'd guess that most folks have no idea what sous vide is. For the record, I don't endorse boiling or sous vide for any sausage. I grill mine indirect to 165* internal. Nicely done, John! What a great idea. Genius idea!! I've never seen the cheddar cheese and bacon brats, but I'm sure regular would work just as well. Come to think of it, I might still have some home made cheddarwurst left in the freezer to try this with. Thanks for the idea.